I'm going to share a secret with you. For the last couple of years, I pray during December and ask God to lead me to a verse for the upcoming year. Some years God leads me to a verse that reminds me to rest in Him (Psalm 62:1). Others encourage me to be more proactive in working for Him (Matthew 5:16). And others are those that help me to better reflect His character (Psalm 19:14). No matter what verse I am led to, it becomes a central part of me for the next year. Here is my secret though, I'm not very good at remembering my goal during my day to day activities. It doesn't really matter what that goal is, whether it was resting in God, letting my light shine, and especially not the goal this year. In the heat of the moment, when I have had little sleep, am under a lot of stress, have a little one still trying to master her own struggle with choosing the right words (and tone), and two teenagers in the house I don't always choose to react in a manner that would be acceptable to God (and upon reflection once I calm down, it really isn't to me either!). Last year, though, I found a way to help me stay more aware of my goal. I purchased a bracelet and had my verse stamped on it. I'm not a bracelet wearer, so having it dangling on my wrist, catching on my shirt sleeve, reflecting the light at times, getting in the way was a constant reminder of my goal. It helped me to stay focused. And as a plus, I had a pretty piece of jewelry to wear and something to remind me forever of the lessons I learned that year. Over time, however, I became accustomed to the bracelet. Like the verse, it became a part of me, no longer an nuisance. As a result I knew another bracelet would not be a good reminder. 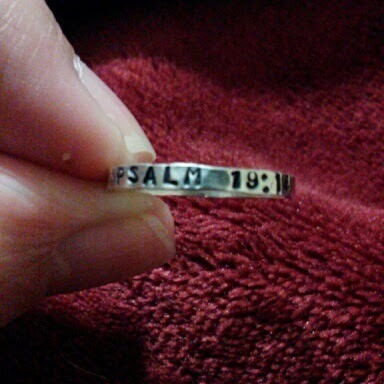 So this year I visited Etsy and found a seller that was willing to create a custom ring with my verse of the year on it. It finally arrived! I don't usually wear a ring on my right hand, so my hope is that this serves the same purpose that the bracelet did. I have been wearing it for about a week now and I have to admit that there have been several times that I have been saying or thinking something and found myself twisting my ring around my finger at the same time. I then stop and consider if what I have said or thought would be pleasing to God.